We are the top retailer and traders of HD Skin Ultra Thin Hair System, Human Hair Wigs, Natural Real Hair Wigs. Our HD Skin Ultra Thin Hair System comes in two different thickness options, one is light hair density and second is heavier hair density. HD Skin Ultra Thin Hair System gives you the most realistic appearance. You can be styled it, however, you want. HD Skin Ultra-Thin Hair System is a choice for those, who may wear a heavier density and want added durability. HD Skin Ultra Thin Hair System’s adhesion is very easy and will stay on for a long time. This HD Skin Ultra Thin Hair System is popular with many of our old clients. Our HD Skin Ultra Thin Hair System can inject your personality. HD Skin Ultra Thin Hair System is really Undetectable. We offer the greatest truthful and top and front hairline appearance. 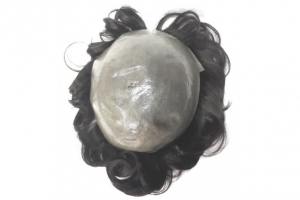 This is the kind of a new variety of hair system which combines the constancy of the PU base and the lace front hairline. HD Skin Ultra-Thin Hair System has a strong grip on hair system with the help of Pu Base. HD Skin Ultra-Thin Hair System is low maintenance.HD Skin Ultra-Thin Hair System is really each hair knots injected one at a time. This Hair System is 100% Invisible and good for those who demand a little more durability. Our HD Skin Ultra-Thin Hair System provides a truly natural hairline. HD skin base hair system takes the shape of your head & almost adheres to the skin pieces of stuff. HD Skin Ultra-Thin Hair System is made of the best quality real human hair, this is one of the best finest systems available in the market. We have transparent and durable skin hair systems and it is looking very natural. We have ultra-thin skin hair systems for men and women.< Each hair is positioned into the transparent thin skin hair base with a new state of the art injection method. The single knot in HD Skin Ultra-Thin Hair System, which looks unbelievably natural – Ideal for swimming, sports, sleep, etc. Keeps this system intact both in bonding method and clipping method. HD Skin Ultra-Thin Hair System is bleached from front knots that give a perfect hairline make the system completely invisible. It is very silky, smooth, soft and tangles free. It’s easy to clean, attach and it gives you a styled free look.